I’m a huge fan of Mexican food and this is a quick and easy way to get my fix! 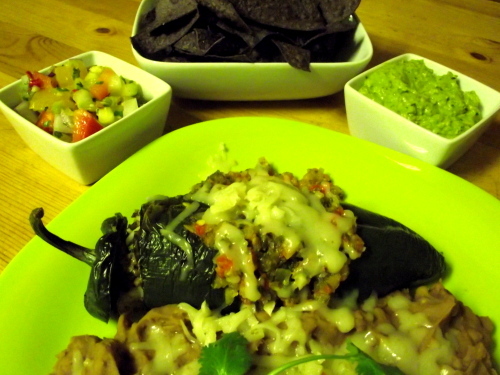 I can’t always find poblano peppers where I live but whenever they appear, you can bet I’m all over it! If you can’t find then, you can sub in large banana peppers but stay away from stuffing bell peppers as they will end up more Mediterranean than Mexican. You can also prep these hours ahead of time and just pop them in the oven when you’re ready! This recipe is for 4 large peppers but doubles or triples easily for larger groups! Cut the top off of your peppers, remove the seeds and then grill them on a hot BBQ until slightly charred and softened. Mix all ingredients except meat, cheese & rice and blend in a food processor until it’s a runny looking soup. Mix half with the meat & rice and save the other half to use as sauce on top of peppers. Now add 3/4 of the cheese and blend together. Stuff the peppers very full and lay on a foil lined tray. Top with remaining tomato mixture and bake at 350 for about 15 minutes and then sprinkle on remaining cheese. I like to serve these bad boys with a little fresh salsa, guacamole, tortilla chips and re-fried beans. Yummmmmm! I get my first praise from my wife by your recipe. She is not spicy cuisine lover but she like it.